Castor oil and carpenter’s tools, nutmeg and wedding bands, porcelain figurines and marbles are just a few recovered items displayed at the Arabia Steamboat Museum. There’s French perfume created more than a century ago – the oldest in the world with its scent intact – and still edible preserved pickles. 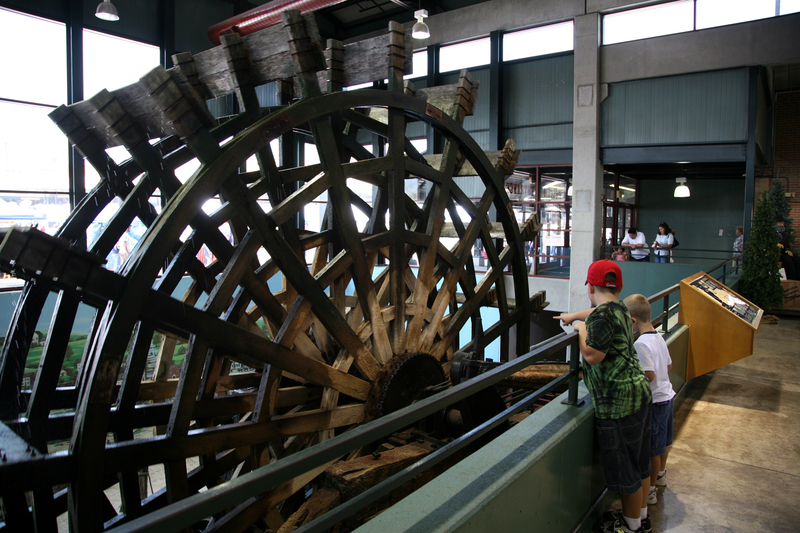 There’s also a 10-ton section of the boat’s stern, a full-sized reproduction of its main deck, and a water-churning 28-foot replica of the ship’s mighty paddlewheel. It turns before a wall-spanning mural that replicates Kansas City riverside view, circa 1850s. 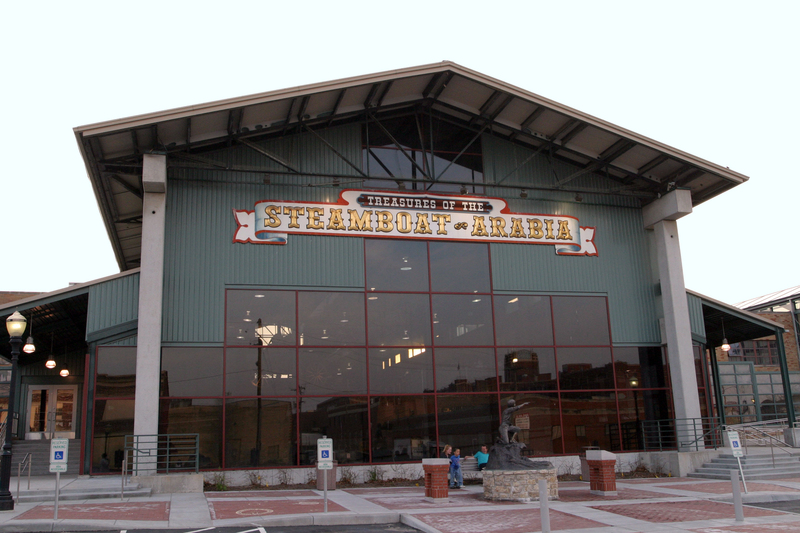 Since it opened, in 1991, Arabia Steamboat Museum has become one of the most popular museums throughout the Midwest. Good Morning America, Readers Digest, National Geographic and Smithsonian are only a few venues that have featured this unusual, privately owned facility. The museum’s story began on September 5th, 1856. As the Steamboat Arabia carried passengers and cargo along the Missouri River, a deeply embedded tree trunk tore through the heart of the boat. Although all of the 130 passengers were rescued (the only casualty was a mule), mud and silt buried much of the vessel, including merchandise bound for frontier stores, the passengers’ personal belongings, and 400 barrels of Kentucky bourbon. More than 130 years later the passage of time had shifted the mighty Missouri’s course. When Bob Hawley, his sons David and Greg, and family friends, David Luttrell and Jerry Mackey excavated the Arabia more than 30 years ago, the enormous vehicle lay 45 feet below ground and half a mile from the river’s current channel. The team had spent a year assembling excavation supplies, and construction equipment. As recovery and preservation expenses grew to more than a million dollars, the team decided to create a museum that would display these treasures for public viewing. What these modern-day explorers unearthed was 200 tons of cargo. Today, visitors from across the globe catch an enduring glimpse of this magnificent vessel before its demise, at the Arabia Steamboat Museum. There’s a short video about excavation efforts and large windows beside the preservation lab provide visitors with an inside look at cleaning and preservation efforts. Doorknobs, and clay pipe bowls, dozens of skeleton keys and a barrel marked ‘spiced pigs’ feet’ were among the excavated treasures. The team found more than five million trade beads as well as Brazil nut shells and pumpkin seeds, thousands of glistening buttons in every pastel color, hundreds of brass thimbles and even a box of ‘segars,’ priced at $1.62. 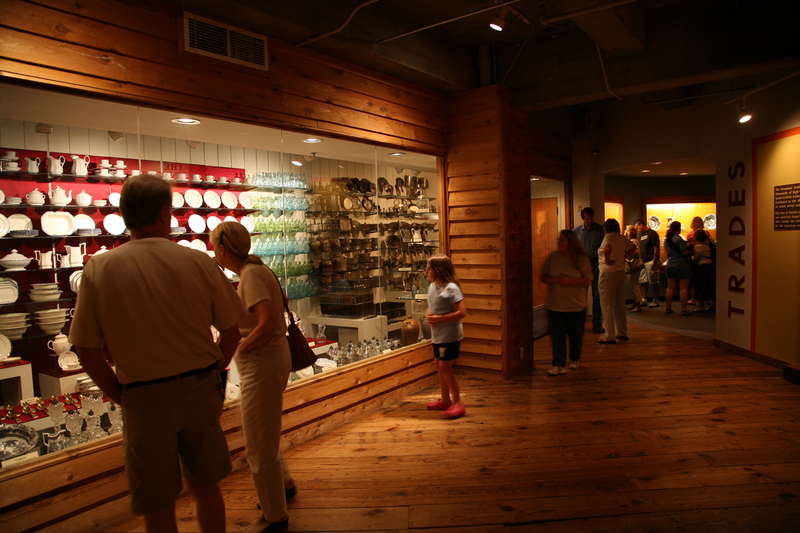 The Arabia Steamboat Museum provides a fascinating look at daily life in the 1850s, through one-of-a-kind displays that showcase personal and commercial artifacts. Arabia Steamboat Museum, 400 Grand Blvd., Kansas City, MO, 816-471-1856. Open daily except on major holidays. Tickets priced from $5.50 to $14.50.